15 years of experience in Architecture, CAD Drafting, Millworking, Architectural metal and glazing, Construction and Project Management. We provide the highest quality and professionalism in carrying out our clients’ requirements from initial stages to final implementation. From a cozy backyard or a cutting-edge kitchen to stunning living spaces depicted by Architectural Digest, from avant-garde clubs to high-end retail stores – we make your dreams come true in conceptual and final design drawings. Our job can’t be too large or too small. We design trade show exhibits that bring out the best in the company and bring more business to our clients. Our multilevel exhibits with “wow” effect always demand attention on the show floors. We incorporate exclusive renderings of drawings that quickly and vibrantly show details of architectural design to our clients. High-quality US architectural drafting and design services from licensed New York Architect. Full Architectural, Design, Construction, Building and 3D Projects 24/7 support. Project budgeting and specific specifications. 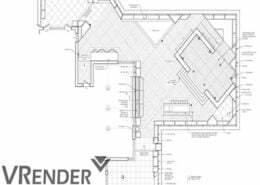 Drawings in AutoCAD 2D and 3D, space planning, retail, commercial, and residential layouts, shop drawing, CAD conversions, Kitchen Design 20-20. Superb accuracy of design elements necessary for any installation or event. 3D Home Architect and 3D Home Design Services. Cost-efficient workflow via producing variety of graphics to illustrate preliminary ideas of conceptual design. Extensive knowledge of design standards, engineering principles, calculation methods, and equipment. Fast, professional and reliable field surveys available in the NYC metropolitan area, as well as worldwide architectural drafting and 3D renderings.